Last year I wrote a post called Some Days You Need A Rainbow and today was a rainbow day both literally and figuratively. Sometimes you don’t even know you need a rainbow until you see one. Like the bubbly laughter of infants, rainbows can’t help but make you smile, no matter how bad your day, week, or year is going. Once you smile, you may realize it’s been a bit too long since you smiled and begin to recall how good it feels. That feeling carries on throughout the day as you think back about that beautiful rainbow and find yourself smiling again, even if it’s just on the inside. Rainbows aren’t possible without rain. Some people have more rain, whether real or symbolic, in their lives and are therefore in need of more rainbows. 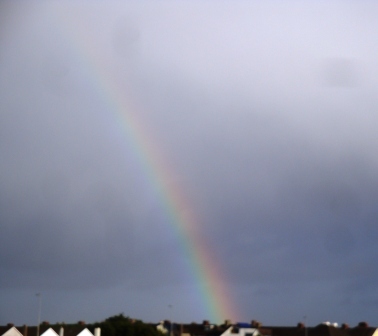 Therefore, if you can’t find a rainbow near you, hopefully this one will put at least a small grin on your face. It certainly brightened my day.